Oh my, such pie! 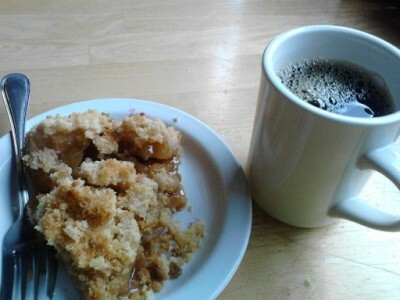 Snohomish Pie Company apple crumb pie. After 3 days of riding the prospect of another 37 miles sounded like nothing to my racing/training husband. These rides were all in Zone -2 for him, or something like that. For me it meant a little mental preparation (you can do it, legs!). Adding up the total mileage for these 4 days brought me to over 117 miles. That’s as much as I might ride in a week if I did my entire 22-mile round-trip commute by bike every day, and I don’t always do that. Thus I planned to break the ride in Snohomish for pie and in Woodinville for lunch and a rest before the final 10+ miles. Granted, the 10 miles to Snohomish wouldn’t take more than an hour, but when you’re biking for all your transportation you won’t feel much guilt stopping for something delicious whenever you want to. 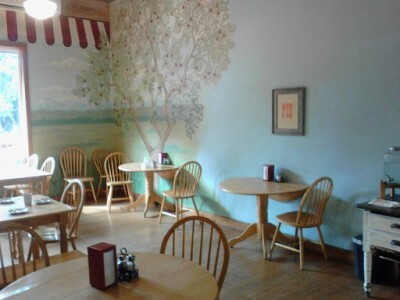 Relaxing place to rest a while in downtown Snohomish, amazing pastry: Snohomish Pie company. We decided to take a different route home to avoid the strange configuration over the highway of Day One and to experience something new. Once we got on our route we discovered it was popular with other riders, as we saw both bike travelers and people out on what looked like training rides and group rides with friends. By now this refrain should sound familiar: We started out riding on the Centennial Trail. Why am I so high on this? Watch this video we created to get an idea (some of the food shots are at Mirkwood, our Arlington lunch stop from Day Three). 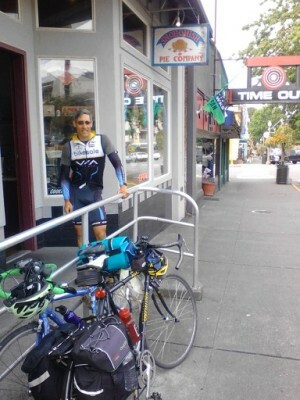 Railing outside Snohomish Pie Company makes for a handy bike rack. In Snohomish we stopped at the justifiably famous Snohomish Pie Company for pieces of apple and berry pie with melt-in-the-mouth crust (my standards are high — my mom made outstanding pies) and coffee before refilling our water bottles and heading out of town. Although this route involved some climbing, we enjoyed the quiet back roads and seeing other riders along the way added to the pleasure. The Commons in Woodinville is a frequent destination for a weekend ride to breakfast thanks to its position close to the East Lake Sammamish Trail and the bike rack out front. I had planned for us to stop there but we ended up thrashing around a bit (in a way not reflected on the map below — I missed a couple of key turns and climbed extra hills) so we kept going. The flat miles on the trail helped, although it was a longer push than I was fueled for. I had a granola bar, which helped, but was sorry I hadn’t packed something to provide faster fueling when I needed it. 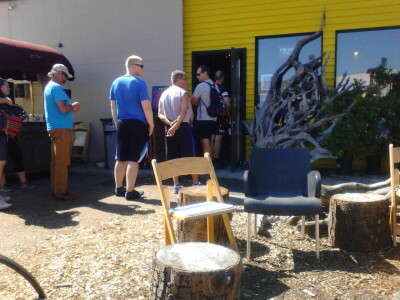 Long line on a nice day at 192 Brewing on the Burke-Gilman Trail. It also helped that this last stretch is very familiar territory. We ride this often and I loved seeing so many people out enjoying the trail: couples, families with kids, people walking slowly to accommodate a grandma or grandpa. The intersection of the East Lake Sammamish Trail and Burke-Gilman Trail was so busy I literally couldn’t shoot fast enough to get a picture of everyone riding through in just a short 5-minute span. When we got to 192 Brewing in Kenmore my empty fuel cells and I called a halt for some black bean dip, chips, and a cold beverage. 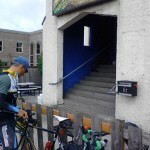 The place was packed, with locals and bike travelers alike lined up at the counter to order and the bike rack on the side of the building overflowing. Location, location, location! Another easy 6 or so miles more and I was home, ready to rest my legs and decide where we might ride for our next bike vacation. A route that lets me take a break every 15 miles or so is just about right. If we were going for a vacation beyond 4 days I would build in some non-riding days for the break. I need to remember to carry something for quick energy and fuel before I feel like I’m bonking, not once I’m into it. That’s a basic lesson I learned long ago but I didn’t take 35 miles very seriously. All depends on the fuel on board. If the forecast says rain, bring the rain booties. Wool socks are a given if it’s going to be cool. Check to see what days most things will be open or closed in a location. Riding is always an attraction so lack of open stores etc. isn’t a showstopper — just good to know (and lost revenue for store owners). Note on leaving the Burke-Gilman Trail: I designed this route to start/end at a transit stop in Lake City, which is my home neighborhood. For route ideas to/from downtown (specifically, the Washington Bikes office) see Seattle to Edmonds — Trip to the Salish Sea. For my “dismount” from the Burke-Gilman southbound I take 42nd Ave NE rather than the much steeper 123rd. I’d rather climb those switchbacks than get off and push my bike up that steep grade at 123rd (because, let’s face it, that’s what I do). 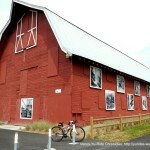 Bed & Breakfast & Biking: Getaway to Lake Stevens by Bicycle. 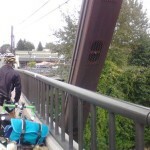 Another great bike tour in our Snohomish County Bikes series. Bike and Hike the Stillaguamish this Weekend! Write your ride! What bike trip have you taken that you want to share with others? What did we miss in the round-up of possible activities? Your favorite places to eat, drink, play, and stay in Lake Stevens, Marysville, Arlington, Snohomish, or somewhere nearby? This article was posted in Adventure, Food, Kids, Lake Forest Park, Lake Stevens, Rural, Seattle, Snohomish County, Tourism, Trails, Travel, Woodinville and tagged Burke-Gilman Trail, East Lake Sammamish Trail, food, Lake Stevens, Snohomish Centennial Trail, Snohomish County, trails. Bookmark the permalink. Follow comments with the RSS feed for this post. Both comments and trackbacks are closed.